Who dares win.....create your own passive income and achieve financial independence. Be in control of your own destiny. Due to the US Federal Reserve keeping a dovish inflation outlook, interest rates have been maintained at the current level and no further interest rate hike is expected for 2019. This is actually a sign that the US macroeconomic condition is weak. But strangely, the stock market, in particularly, REITS rallied in valuation. However, my thoughts are that if one is investing mainly for income generation, then short term fluctuation does not have much meaning unless one is doing frequent buying and selling of stocks for allocation of funds to the most undervalued assets. One would need to overcome the issue of lack of diversification too. In addition, timing the market is actually very challenging unless one has a crystal ball that can peek into the future. 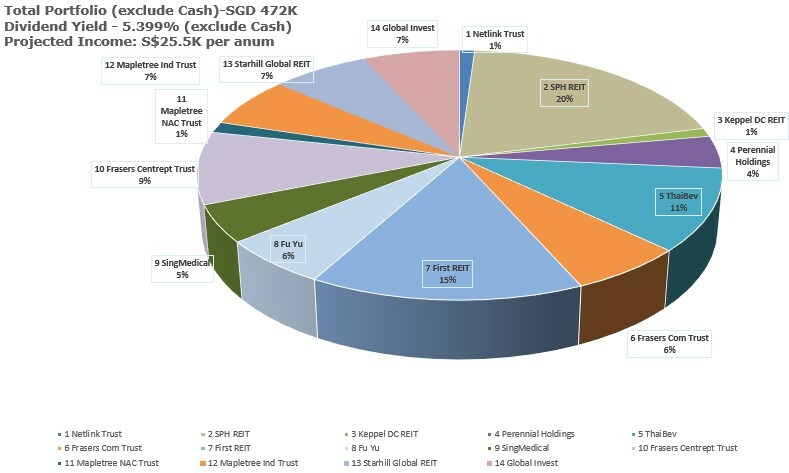 I have injected additional funds of approximately S$10K into Netlink Trust (S$5K) and Keppel DC REIT (S$5.2K) which are slightly more defensive in nature in view of my pessimistic economic outlook. Being in the supply chain industry, I am seeing a contraction in the volume of shipments moving in and out of Singapore. Oil and Gas business segment is in particularly bad shape and in doldrums in spite of the recovering oil prices to USD70 to USD 80 per barrel range which were way higher than the USD40 a few years back in 2016. Also sold off Singtel and Parkway Life REIT and did a bit of asset re-allocation to First REIT, Mapletree Industrial Trust as well as Mapletree NAC Trust. I actually do not like Netlink Trust due to the uncertainty over its future cash-generating ability over the threat of 5G technology implementation in Singapore. The key issue here is the effect of the gain in 5G base stations connecting fees over the loss in consumer/corporation subscription upon the switch to 5G. Have parked some funds into Netlink Trust for now due to the short term stability offered while waiting for more details on the charging mechanism. Please refer to my previous post on "Upcoming 5G Network Technology and Imminent Threat to Netlink Trust Business". The WALE is 8 years. This is a high technology business support segment on data hosting. Also, once tenant shifted in, much setting up cost would have been incurred. Any exit or migration to other DC requires very detailed planning and extensive resources. Overall low yield but relatively stable based on its historical performance. Have sold off my stakes in Singtel. I do not like the recent rights issue which Singtel took part in for its India market Bharti Airtel associate. Singtel is also fighting a bruising battle with its competitors in Singapore market and Australian market. These are 3 key markets where Singtel derive most of its profits. I do not see how the profit margin will improve in view of the tight competition in this 2-3 years. Fundamentals of Singtel is good but my preference right now is to sell off and re-deploy to other stocks. The property management team has been diligent and disciplined in growing the asset under management. The reasons I bought into Mapletree Industrial Trust are listed in my previous posts here. Mapletree Industrial Trust has demonstrated earnings resiliency over the years and I like its new strategy of going into high tech data centre segment to exploit on cloud and internet of things. Please also refer to Pt 2 Keppel DC REIT with regard to the defensive attributes of a data centre business. Sold off and took profits. Reinvested most of the proceeds into First REIT. Added more units for First REIT. First REIT is currently trading below its NAV. It has fallen more than 40% from its peak of S$1.42 per unit. Institutional investors and other retail investors have been busy selling of First REIT. The key risk in holding on to First REIT is that Lippo Karawaci will default. However, this is unlikely given that Lippo Karawaci has won approval from shareholders at the recent AGM held on 18th April 2019 to proceed with the rights issue. USD730Mil will be raised. Also sales of asset expected to bring total fundraising to USD1 billion dollars which will shore up its balance sheet and improve credit ratings. Please refer to my previous post on "First REIT- 5 Key Risk Factors". If one believes in the long term prospects of healthcare services given the aging population, then I believe First REIT has a rather good growth storyline in place. Took profit by selling additional units in view of the surge in stock price. Will wait for the announcement of the recent quarter performance in May'19 to decide on further action. Jan'19 to Mar'19 quarter results are expected to be even better than the preceding quarter due to the general election in Thailand. 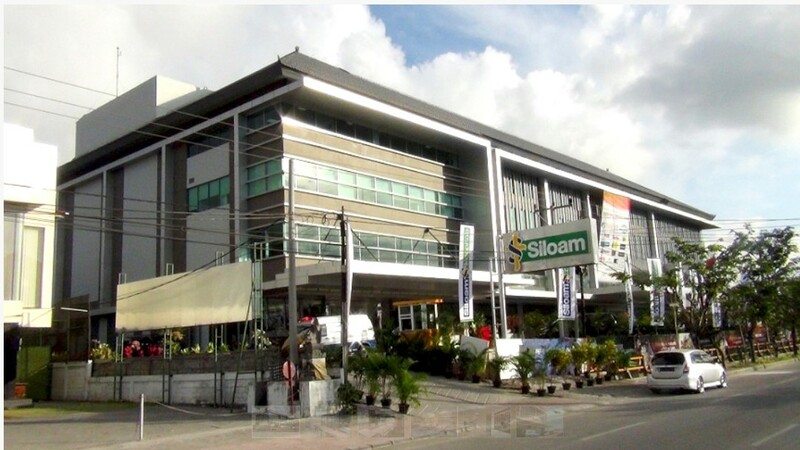 (iv) the new owner OUE Lippo might force upon First REIT to take up non-yield accretive asset healthcare assets. The track record isn't pretty given the outcry over what had happened to the REITS under OUE. As a matter of fact, when the Riady family are on a war path for fund raising, bad things may befall shareholders....look at Lippo Mall Indonesia Retail Trust. (v) shareholders need to keep significant spare cash on hand for upcoming rights issue for M&A. The management has set a target to acquire OUE Lippo healthcare assets to diversify its Indonesia asset base. If the rights are set at a huge discount and one does not have the sufficent fund to subscribe, then the holdings in First REIT will be severely diluted. I also believed that the Riady family has invested a lot in the medical equipment and doctors staffing the hospital healthcare segment for them to give it up easily. Renewal of the upcoming expiring master lease in 2021 should not be an issue. This leaves us with issue (iii), (iv) and (v) to worry about. Victor Tan (CEO of Manager of First REIT) had shared some of his invaluable insights on a radio talk show before on some of the above-mentioned issues. Anyway, if one believes in the long term prospects of healthcare services given the aging population, then I believe First REIT has a rather good growth storyline in place. 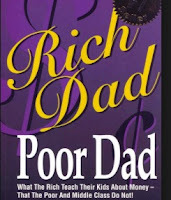 Every once in a while, Robert Kiyosaki and "Rich Dad Poor Dad" will either get mentioned in my daily conversation topic with friends and relatives or emerge in some websites or blogs that I am reading. Hence the purpose of this post is just to write down my own personal view. I first got introduced to the famous financial literacy book "Rich Dad Poor Dad: What The Rich Teach Their Kids That The Poor And Middle Class Do Not" by the great Robert Kiyosaki during my University days. My school mate from Indonesia asked me whether I got read "Rich Dad Poor Dad" while we were working on a project together. I replied to him that I had not heard of it let alone read it and my entire group of friends all looked at me with disgust as if I am a "SuaKu" (Mountain Turtle). Feeling absolutely embarrassed by my own ignorance that there is this great legendary financial literacy book, I went to purchase a copy of it from the bookshop. It was a good and informative book no doubt, but from my personal perspective, I was rather put off by Robert Kiyosaki worshipping the "Rich" Dad (I think) excessively and instead portrayed his own Dad who gave him life as someone so much more inferior due to the traditional mindset on work and financial literacy. 1. Shocking Revelation: "Rich Dad" is Not Real, but a Myth Like Harry Potter. Robert Kiyosaki bluffed! Is There Poor Dad? 2. Does Robert Kiyosaki's 'rich dad' actually exist? 3.Rich Dad Poor Dad... 2019? Robert Kiyosaki? I would take what was written in Rich Dad Poor Dad with a pinch of salt. There are a lot of good pointers mentioned but don't just take it as if everything is true and invaluable. While I was impressed on the overall ideas presented, nevertheless, Rich Dad Poor Dad never had a significant influence on me. It is more of like the famous "Chicken Soup For The Soul" series for the feel-good effect. I simply could not discern facts from fiction written in the book based on so many critics doubting the authenticity of the "Rich Dad". Furthermore, this kind of undermining one's own Dad and putting the "Rich Dad" on the pedestal makes me wonder whether this is just a marketing technique to gain maximum attention. Read it for yourself....you can either choose to love it or hate it....but the fact still remains that this is one of the most read financial literacy books that have sold over 58 million copies worldwide. Are you one of the folks who swore by everything taught in "Rich Dad Poor Dad" or do you belong to the skeptical group? 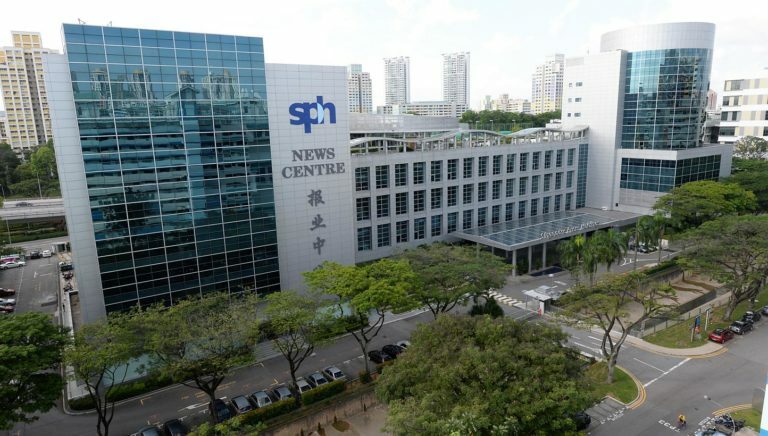 Singapore Press Holdings (SPH) recently announced its 1st half results and its property segment now contributes to almost two-third of SPH’s “Profit Before Taxation”. This is a significant contributor to operating profits and marks the close completion of its transformation from a Media Group into a Property Holdings Group. Nevertheless, from a revenue generation perspective, the Media segment is still bigger in size than the Property segment. Traditional Media remains profitable but is still declining and we just could not see any signs of the rock bottom being formed yet. As such, traditional Media will most probably continue its decline over the next few years and remain a drag on the overall profit margin. My thoughts are that investors would be better off investing in SPH REIT if the preference is for a pure property rental income play. In the era of Google, Facebook and other online media, it is increasingly hard for SPH to hang on to its traditional advertising revenue. But overall, I quite like the announced results for SPH which clearly shows the transformation exercise from media into property bearing fruit. The student accommodation business is the most interesting part of SPH new business growth strategy. It has been proven that this business segment is virtually recession proof as evident in the performance of this class of property asset during the 2008 financial crisis. The additional acquisition of student accommodation properties will thus strengthen the recurring income stream in all economic environment. 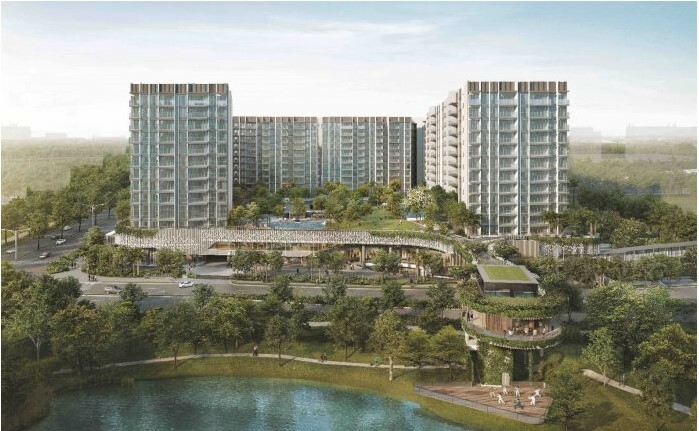 The sales of only 30 units out of 667 units (only 4.50% sold at VVIP preview) of Woodleigh Residences during the first weekend soft launch in late October 2018 is also extremely worrying. Clearly, the market has slowed down since the various cooling measures rolled out by the government. Trying to sell off units at 2,000psf in the face of diminishing pool of buyers has become extremely challenging. The longer this drags on, the higher the chance that SPH property development will enter into an economic recession with many unsold units. All eyes will be on the planned “official launch” of Woodleigh Residences by end of May 2019. SPH and its partner Kajima had invested S$1.132 billion to acquire this plot of mixed-use site in Bidadari. The slightly disappointing aspect from this recent announcement is that SPH management team had again cut the dividends. Interim dividends got cut from S$0.060 in FY17/18 to S$0.055 in FY18/19. Based on the closing share price of S$2.44 as at 11 April 2019, the projected dividend yield for this financial year will be 5.07%. Summarising, I think that the new growth path lead by its property investment remains intact and will eventually make up for the declining traditional media segment. 3 key upcoming events to watch out for First REIT for this quarter. (1) The AGM for FY2018 will be held at Mandarin Orchard Hotel on 9th April 2019. There is a resolution tabled on top of other routine resolutions such as re-appointment of auditors. The additional resolution sought to change the Trust deed and proposed that the distribution payment period of First REIT be amended from 60 days to 90 days. (2) The other major event is the announcement of 1st quarter results on 10th April 2019. (3) The third event would be the AGM of Lippo Karawaci on 18th April 2019 to approve the US$730 million dollars worth of rights issue to resolve the liquidity crisis. 1. Additional resolution to change the distribution payment period of First REIT from 60 days to 90 days during AGM on 9th April 2019. The rationale for the proposed amendment was due to the change in ownership of the REIT manager which have been effectively bought over by OUE Lippo Group. Based on the Manager's post-completion review to synergise operations with other OUE Lippo entities, if the distribution period of First REIT were to remain at 60 days, First REIT would have to operate on a different payment cycle and operating cycle from OUE H-Trust and OUE C-REIT. The change in the distribution payment date will thus streamline the operations of the REIT manager and generate savings in time and resources. It was further made known that unitholders are not materially prejudiced by the change in timing of First REIT's distribution payment by this extra 30 days as First REIT can earn interest on the distribution amount during this period. I think that great emphasis was placed on the elaboration that this is purely operations planning due to the takeover so that investors do not make wild guesses that this is due to cash flow difficulties. 2. The announcement of Q1 FY2019 financial results and amount for distribution on 10th April 2019. Looking forward to the release of the results on 10 April 2019 (Wednesday) after the end of its closing and the upcoming dividends payment distribution. This is a closely watched event by the entire market that will determine the fate of the entire fortune of Lippo Karawaci as well as First REIT. Once the shareholders approve the rights issue, it will guarantee rental payment for FIRST REIT for the next 2 years from funds being set aside for this purpose. I think that to me, point 2 and point 3 as alluded to the above mentioned are very important and I will be monitoring them closely. I have sold off 20,000 units previously in Feb'19 at an average price of S$1.10 to reduce my concentration risk. With the announcement of the rights issue at Lippo Karawaci, I think that the holding risk has become more palatable and have begun accumulating 45,000 extra units of First REIT at around S$0.990 to S$1.00 per unit. 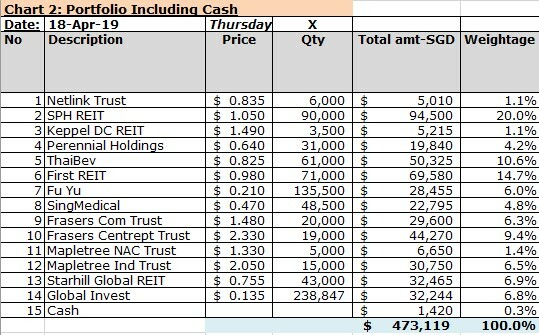 As at 5 April 2019, I am holding on to 71,000 units of First REIT which is around S$70K. I rationalized that with the completion of the rights issue and appointment of 3rd generation leader John Riady as new Lippo CEO to improve the tarnished image, the risk premium required by the market will go down and there will be at least a 10% capital appreciation over the next year. In the meantime, the 8.5% dividend yield should compensate for holding on to First REIT and hopefully, cover for the plunge in price (during the lead time from bad news announced and selling off of units) should things go awry. In an interesting turn of event, PUB- which I previously posted that it had single-handedly stopped the Salim Medco rescue package- turned out the be the real white knight because most stakeholders have mistaken its good intention. By taking away the loss-making Tuaspring desalination plant, PUB has let Hyflux off the hook on the business unit that is making its business bleed profusely. In addition, PUB added icing on the cake by further waiving off compensation claims for breach of contractual KPIs. What a dramatic week it turns out to be with the latest development. Even though the government insisted public fund cannot be used to help retail investors, I now view the above as a partial bailout by the government. By foregoing the rights to the very low water tariff rate locked in with Hyflux, the government has released Hyflux from its Achilles’s heel. Meanwhile, Tuaspring power plant still resides with Hyflux. Hyflux has made a statement that given this turn of event, many buyers which have previously stayed away might make a bid to rescue Hyflux now. From the public perspective, taxpayers are the ones losing out as we are actually funding the plant with the increased cost of running it now borne by PUB at prevailing material and labour market rate instead of the “discounted rate” that Hyflux was initially contracted to provide. Hence no bailout as asserted by PUB and government but in fact, personally, I rationalized that it is actually a form of partial bailout due to “the need to safeguard the security of our water supply”. The S$38.9 Mil in question is a lot of money. The irony of this is that if Salim Medco had not made the offer of rescue in the first place, Hyflux will not even be able to get a single cent. Now that the rescue deal is off (as good as never offer in the first place), Hyflux suddenly stood to gain S$38.9Mil. This is good money for Hyflux. I am sure that this sum of money can be used to finance legal fee payment and reimbursement for aborted booking fees incurred for the credit restructuring meetings that never took place. This does help the creditors to have some spare change in the event of liquidation. Who are the legal team lawyers representing Hyflux? They are damn good in their work! The legal team advising Hyflux are damn good. First, they argue that Salim claim of material breaches is not valid and hence the White Knight cannot just walk away from the deal. They bite on and refuse to let Salim Medco escape from the deal. Subsequently, when more clarity arises from PUB on Tuaspring, the legal team of Hyflux swoon in and wrote formally to Salim Medco demanding to know whether the white knight will still honour the deal with a clear and unequivocal written confirmation. Since there was no confirmation on this, the Hyflux legal team is now arguing that it is Salim Medco which repudiates the deal. Accordingly, Hyflux will be entitled to retain the S$38.9Mil kept in escrow. The legal team seems to be from Wong Partnership. One of the top law firm in Singapore with many of the brightest in the legal profession also there. Manoj Pillay Sandrasegara is the partner of the Restructuring and Insolvency Practice who is advising Hyflux in its US$2.3 billion restructuring exercise. 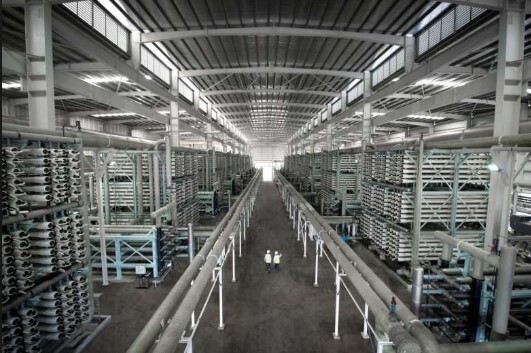 The legal advisor will probably be filing for an extension of court protection for at least another 2 to 3 months for Hyflux to find another shining white knight by arguing on the better slate of its business operations with the loss-making Tuaspring desalination plant out of the way. Oliva Lum will be fighting hard to save her baby. In my last posting on whether is it time to buy into Industrial REIT, I have illustrated the poor rental charges of industrial properties using the JTC indexes from 2016 to 2018. All industrial property types pricing indexes with the exception of business parks have been in the doldrums. REITS with warehousing facilities such as Cache suffered the worst hit. The local warehousing space for logistics usage has not yet seen any significant recovery and prices still hover around S$1 per sqft in western Singapore relative to more than S$1.50 psf a few years back. The market climate remains challenging for industrial REIT due to the upcoming ready available supply of new industrial space. I do not think that there are any hidden gems right now given the current operating environment and the recent run-up in most REITs pricing. The worrying global macroeconomic conditions may also further adversely affect this particular REIT segment. The higher yield from industrial REIT solely lies in the higher risk premium associated with such class of assets. However, I have started selling off part of my other holdings (Singtel & Thai Beverage) and begin buying units in Mapletree Industrial Trust (“MIT”) at between S$2.01 to S$2.03. For this post, I will be skipping the historical financial performances review (which has been readily covered by analysts) and instead focused more on the future prospects of this REIT as well as the apparently more resilient earnings relative to other typical industrial REITS which should enable MIT to weather through any possible economic crisis better than its other rival industrial REIT. The main reasons for accumulating Mapletree Industrial Trust are due to the better quality properties in its stable of portfolio as well as their diversification into data centers segment which is a high in demand supporting segment for the new high tech digital economy. In addition, the close to 6% yield is a lot higher than my current weighted average portfolio return of 5.1% due to significant concentration in Retail REITs which are lower in terms of yield. 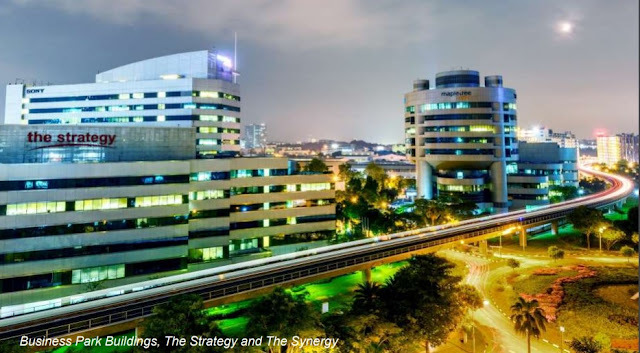 MIT's portfolio comprises of 86 industrial properties in Singapore and 14 data centres in the United States of America (40% interest through the joint venture with Mapletree Investments Pte Ltd). Mapletree has the full support of Temasek Holdings. Nothing much more needs to be said on what this means. The yield for MIT is thus lower relative to other Industrial REIT due to lower risk premium perceived by the market. The sponsor of MIT always seems to be able to get its hand on developing or acquiring many good quality properties. Another good example is Mapletree Commercial Trust ("MCT") that is holding on to Vivocity and Mapletree Business City. MCT has been elevated to "God like" status recently on the stock exchange and its price seems to have re-rated as evident in its ever rising prices and consequently, yield demanded by investors drop to slightly below 5% from the re-rating on its risk profile and good track record in its financial performance. 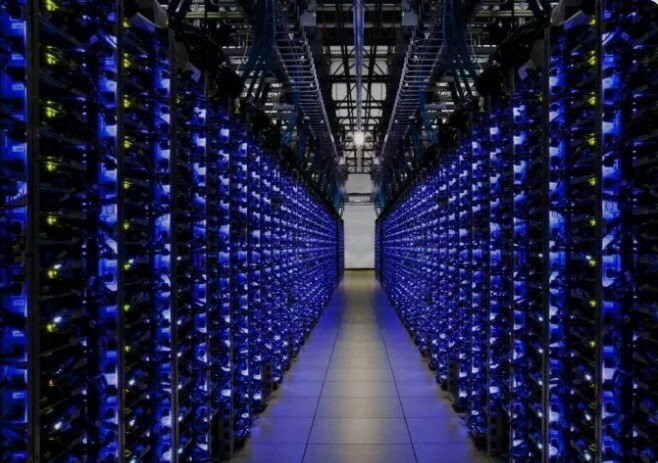 The internet of things and cloud services will continue to drive demand for data centres in the new economy. The business strategy to focus more on high-value industrial sector will drive the future growth of MIT as well as enhance its earnings resiliency. In October 2017, MIT and its sponsor, Mapletree Investments entered into a joint venture to acquire 14 data centres in the United States of America for US$750Mil on a 40: 60 shareholding basis. This vital strategic acquisition thus extends Mapletree group's footprint in the fast-growing data centre segment. The data centres are located on freehold land and leased out to 15 high-quality tenants from a diverse range of industries such as telecommunications, information technology as well as financial services. The tenated properties have a long weighted average lease to expiry of around 5 years with fixed annual rental escalation of 2% embedded growth. 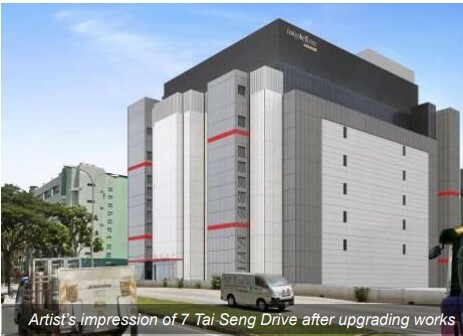 In Singapore, MIT will be converting and upgrading its 7 Tai Seng Drive industrial property into a data centre. This is in collaboration with Equinix Singapore as it expands its presence locally. This builds on Equinix's current presence at 26A Ayer Rajah and 180 Peachtree, Atlanta in the United States. The work at 7 Tai Seng Drive is expected to be completed by second half of 2019 and will contribute positively to the rental income of MIT. I used to have lunch at 18 Tai Seng. There is a soya sauce chicken rice restaurant at 18 Tai Seng that was opened by Hawker Chan who won the 1 Michelin star award at his original Chinatown Food Complex stall. The name of the outlet is “Liao Fan Hong Kong Soya Sauce Chicken Rice and Noodle”. Tim Ho Wan and also Jalan Kayu Roti Prata also took up retail outlet space at 18 Tai Seng. Being a modern industrial development, 18 Tai Seng is a nine-storey special mixed use development that comprises of retail space, industrial and office all integrated into one. The building is connected directly to Tai Seng MRT via underground pedestrian link and easily accessible via public transportation and major expressways such as KPE, PIE and CTE. This property has a tenant base of 44 tenants including multinational firms in a high value-added services such as medical technology, information and communications technology and automotive technology. As at 13 December 2018, the committed occupancy rate was reported to be 94.3%. 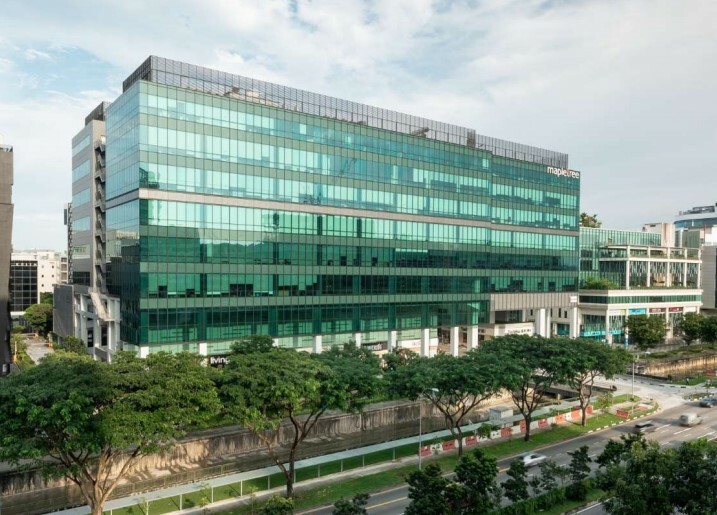 The proposed acquisition of 18 Tai Seng for S$268 Mil announced in Dec 2018 is in line with MIT’s business strategy of a greater focus on hi-tech buildings. If you are a tenant or renovation contractor, you will not like the Mapletree Property Management Department during the handover back to landlord upon lease expiry. From my past dealings, AIMS AMP Capital and Cache are more willing to compromise in the sharing of disputed reinstatement cost as compared to Mapletree folks. Mapletree, on the other hand, are very notorious in the market for very stringent and demandng handing back conditions (they expect almost brand new conditions during handling back). But if you are an investor of MIT, you will absolutely love their Property Management team for enforcing such high standard and uncompromising stance. The Property Management team also enforces the same demanding regime in the maintenance of the common area defects and are aggressive in pushing back repair costs for damages to the tenants in a building. I see good potential in the organic future growth of MIT especially with the recent acquisition of 18 Tai Seng as well as the venture into data centers with a focus on high technology sector tenants. Most importantly, there is good diversification in terms of its current tenants which will enable MIT to weather any major storm. Last but not least, this is a Mapletree REIT which have excellent pipelines of good properties from its sponsor for future injection into MIT as part of its asset recycling strategy. Now Is The Best Time To Buy Private Property? The increase in tax rate to 20% led to HUGE LOSSES in Q1 2018 for Asian Pay TV Trust? Myth or Fact? Readers are advised to do own due diligence pertaining to any materials or data from this blog. Picture Window theme. Theme images by konradlew. Powered by Blogger.